There are around 2, 800 species of termites in the world, and termite population outnumbers that of human. In the U.S., there are around 45 species of termites. Apart from being numerous, they are also voracious eaters. A single colony of termites can eat up to 1,000 pounds of wood per year; it’s around 650 baseball bats! 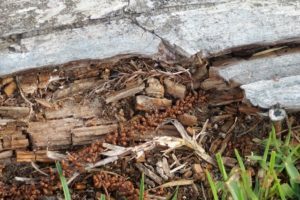 Dampwood termites make their home in damp, decaying wood. They are considered an economic pest along the Pacific coast. These termites want damp wood, so homes with moisture or plumbing issues can be infested with this type. Subterranean termites or ground termites, as the name implies, live underground. They tunnel underground up to 150 feet (45.7 meters) to find food, which is wood. According to statistics, these termites cause 95 percent of all termite damage in North America. A colony of subterranean termites can eat up to 15 pounds (6.8 kilograms) of wood every week. The most destructive type of termite is the Formosan termite. These termites are most common in Louisiana. They’re also found in New Mexico, California, North Carolina, South Carolina and Georgia. These termites love wood and other cellulose-based goods and will invade boats and live trees. Unlike subterranean termites, Drywood termites live above ground. They are abundant in Southern California. They make their colonies in attics, door-frames, and window frames. Termites destroy property. Each year, they cause damage amounting to $5 billion dollars. They can also affect the health of family members as they release gas when they break down the wood they eat. According to research, termites release around 150 million tons of methane gas each year. For new property owners, it’s important that the soil is thoroughly inspected before construction. Pest management supply and termite service providers usually apply liquid treatments to soil prior to the pouring of building slabs to make sure there will be no termite infestation in the future. Parsons Pest Control provides termite treatment before construction. There are several procedures involved in this, including treating the soil before the foundation is created. You can trust Parsons Pest Control to help you ensure pests are eliminated before you build your home.